400+ BabyandKids Coupons and Offers From BabyOye, FirstCry, HopScotch etc Stores. Avail upto 80% Discount On kids Clothes, Toys, Diapers, FootWear etc. Shop fashion apparels from Top 10 brands. Get 10% off on your order by using this coupon code. Limited period offer. Buy baby gear products from Firstcry and get huge discounts. Get 40% on selected Babyhug range. Maximum Discount is Rs. 3000. Coupon not valid on Babyhug Fashion and Accessories. Firstcry offering 35% off on Dove products. Maximum discount is Rs. 1000. Coupon code is not valid on Combos and Guaranteed Savings Offer. Special offer on the diapers of Huggies diapers brands. Flat 30% off by using this coupon code before making transaction. Hurry Up!! Shop baby care products from Firstcry and grab best discount price. Save 32% on your order. Maximum discount Rs.3000. Coupon code is not valid on Combos, Bottles & Accessories and Formula & Supplements and brands Charlie Banana, Foscam, Melissa & Doug, Motorola, Tupperware, Wanna Party, Bio Oil, BeCool, Alex Daisy, Jane, Chicco. Limited period offer. Hopscotch festive offer for all users!! Buy the huge range of clothing, footwear, accessories for the kids of different age and get Rs.200 off discount on your total bill value. The minimum order value is Rs.1000 and above. Offer valid on sitewide products and on orders made on web and app only. Coupon valid once per user. Order today!! Do not miss this offer. Shop brand new kids apparels and accessories from Hopscotch. On minium orders of Rs.1000 above save Rs.150 by using this coupon code. Hurry Up!! Special sale!! Order sleepwear products and get Rs.300 off. Valid on orders Rs.1000. Hurry Up!! Hopscotch offering best offer on kids wear apparels. valid on minimum orders off Rs.1200 above. Buy any 2 get 1 free. Add 3 products to cart which is less price you can get it for free. Apply this Hopscotch coupon on the checkout page to get discount. Hurry Up!! 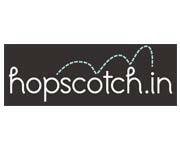 Hopscotch offering discounts on apparels and accessories. Save up to 60% + extra Rs.250 Off On Orders Rs.1500 above. Limited period offer. Shop kids apparels from Hopsscoth. Shop any 2 products and save Rs.350. Valid on orders of 2 products. Limited period offer. Shop designer girls frocks from Hopscotch. Buy 1 and get 50% off on 2nd frock. valid on orders above Rs.1400. Use this Hopscotch coupon code on the checkout page to get discount. Hurry Up!! Shop party wear apparels and get 40% off by using this Firstcry coupon code. Hurry Up!! Shop for kids apparel from Babyoye and get a discount of up to 70%. Discount valid on selected products displayed on the landing page. Choose from ethnic wear, casuals, party wear and lots more from all top brands. Hurry!! !Offer valid till stock lasts only. Now shop for premium collection for your kids from Babyoye and get a discount of up to 50% on all products and an additional cashback of 50% on all orders. Use this coupon code at the checkout page to avail this offer. Get a maximum cashback of up to Rs. 700. Hurry!!!!!!!! !Limited period offer. Now buy toys for your little ones on Babyoye and get up to 50% Off. Also get additional cashback of 25% on orders above Rs.1000. Use the above code at checkout page to avail offer. Choose from a lot of varieties of toys from top brands available in various price ranges. Shop a wide range of clothing, accessories, footwear, baby essentials, toys and games etc at Firstcry!! Get flat 30% off on the site wide products. Pay Using Paytm and get 10% cashback. Maximum cashback value is Rs.100. Valid on One transaction per user. Hurry up!! Purchase now. Offer ends soon. Shop baby care products online from Firstcry. Flat 35% off on baby care range. Coupon code is valid on Baby Care except on Combos, Bottles & Accessories and Formula & Supplements and brands Charlie Banana, Figaro, Xbox, Sony PlayStation, Foscam, Melissa & Doug, Motorola, Tupperware, Wanna Party, Bio Oil, BeCool, Alex Daisy, PediaSure, Horlicks, Protinex, Nestle, Jane & Cetaphil. Limited period offer. Special offer on Diapers!! Get 35% Off + 25% Cashback On Entire Diapering Range. Brands are Mamy Poko pants, Huggies, Pampers, Cuddles etc and more. Maximum cashback value is Rs.250. Offer valid for all users. Offer applicable for sitewide diapers. Apply the promo code and grab the cashback now. Limited period offer. Here is a best offer from Firstcry!! Save 40% on entire carter&apos;s range. Limited period offer. Shop baby care products and get 35% OFF + 25% Cashback. Coupon is not applicable on Combos, infant feeding & brands Charlie Banana, Foscam, Figaro, Xbox, Sony PlayStation, Melissa & Doug, Motorola, Tupperware, Wanna Party, Bio Oil, BeCool, Alex Daisy, Jane. Special offers at Firstcry!! Shop a huge range of fashion products and accessories perfect for kids of different age groups for the best prices. Get A.T.U.N brand clothing products such as Picnic striped frock, Columbus cloud striped, ruffle dresses, stripe shanaya dress and more and save flat 50% on total cart value. Offer valid for all users. Hurry up!! Order now. Fantastic offers from Firstcry!! Shop Baby carriers, sling pouch, baby car seat, strollers, baby carry cot more and get up to 30% off savings on total cart value. Offer valid for all users. Offer valid on travel shop products only. No code required. Order now. Fantastic offers every day from Hopscotch!! Shop huge fashion apparel and accessories for kids and get Rs.400 off on total cart value. Minimum purchase value is Rs.2000. Offer valid for the old and new user. Bookings must be done on the app and website only. Apply the coupon code to avail the discount. Limited period offer. Hurry up!! Grab it soon. Special offer on the Mamy Poko brand!! Shop Mamy Poko pants, wipes and get flat 35% discount and 25% cashback on the listed products. Maximum discount value is Rs.800. Maximum cashback value is Rs.250. Offer valid for all users and only once per user. Apply the coupon code and avail the offer soon. Limited period offer. Shop diapers and diapering essentials of the brands Huggies, Mamy Poko pants, Pampers, Cuddles, Bella etc and get flat 35% discount on these diapers fest offers. Offer valid for all users and only once per user. Maximum discount value is Rs.500. Offer applicable on Diapers and diapering essentials only. Use the coupon and avail the discount. Special offer on Baby Gear products!! Buy baby car seats, carriers, carrycots, strollers, prams much more and get flat 35% off savings on total cart value of these baby gear products. Maximum discount value is Rs.3000. Offer valid for all users. Apply the coupon code and grab the offer soon. Get Registered with Firstcry, which is the perfect store for all the babies, toddlers, carters, kids and children of different age groups!! Sign up now and get Rs.2500 worth cash coupons. Offer applicable for new users only. Hurry up!! Register now and grab the cash coupons soon. Purchase the varieties of fashion products such as partywear, ethnic wear, western wear, jackets, tees, footwear much more from Firstcry premium store and get flat Rs.400 off on your purchase. Minimum purchase value is Rs.1100. Offer applicable on first time purchase from the premium store. Applicable for new users. The coupon code is not valid on Diapers, Combos, Bottles & Accessories, Formula & Supplements. Use the coupon code and avail the offer. Shop various toys such as collectibles, action figures, musical books, fairy dolls, etc of brands like FisherPrice, Lego, Funskool, Barbie and get flat 35% off discount on these 4 most loved brand of toys. Maximum discount value is Rs.1000. Offer applicable for both new and old users. Coupon code valid only once per user. Do not miss this collection. Order them today!! Special offer on the mom and maternity products!! Shop maternity bottom wear, dresses, skirts, ethnic wear, footwear of various brands such as Medella, Krithi, Palmers, Crocs, Uzazi etc and get 25% savings on your cart value. The minimum order value is Rs.750 and above. Offer applicable for all users and only once per user. Use the coupon code and to avail discount. Grab the offer now. Make the little one&apos;s birthdays even more special and interesting with the products like birthday kits, carry bags, hats, hand fun, invitations much more and get flat 25% discount on the cart value. The minimum order value is Rs.750 and above. Offer valid on the birthday and gifts category only. Applicable to all users. Do not miss this offer. Purchase now. Shop books with music, books with stickers, activity books, colour books many other CDs, school supplies and get flat 25% discount on these products. Maximum discount value is Rs.2000. Offer valid for all users. Coupon valid only once per user. Purchase them now. Hurry up!! Firstcry Fantastic offers on the fashion apparel, footwear, toys, gaming, carter&apos;s products much more. Shop baby food, infant formula, bibs & hanky, bottle cleaning & sterilization, Bottles, accessories and get flat 30% off discount on these products. Maximum discount value is Rs.2000. Offer valid for all users. Hurry up!! Grab the offer soon before it ends. Get the cute little ones the perfect baby gear and nursery products at Firstcry!! Shop baby car seats, carriers, carrycots, strollers & prams etc. Get flat 30% off on these products. Maximum discount value is Rs.3000. Offer valid on the Baby gear and nursery products only. Applicable to all users. Apply the coupon and grab the offer soon. Purchase the Intellikit programs for different age group Children to develop their right skill at the right age. Get the 3 kits at the price of Rs.1499 only. Offer valid for all users. No code required. Shop them today!! Fresh offer for all users!! Shop a huge range of fashion apparel, toys, gaming products, footwear, personal care much more and get minimum 15% off on the entire sitewide products. No code required. Do not miss these great savings. Buy them now. Special offer for the all Lil ones at Firstcry!! Shop various toys and gaming products like crafts, action figures, collectibles, baby rattles, bath toys etc. Get flat 25% discount on these products. Minimum purchase value is Rs.750 and above to avail the discount. Limited time offer. Hurry up!! Special offer on the party collection for the little cute ones at Hopscotch!! Buy products like party dresses of various styles and designs for different ages. Get a minimum 30% off discount on these products. Offer valid for all users. No code required. Shop them today. Hurry up!! Let the cute little ones of different ages celebrate brighter this Diwali with the various styles of the ethnic collection. Get up to 65% off discount on these various ethnic fashion for boys and girls of different ages. No code required. Offer valid for all users. Hurry up!! Fill your cart today and shop for them. Shop for the huge styles and various trendy apparel for the little ones. Get 5% off on these wide ranges of products. Applicable to new users. Use the code at checkout and grab the offer soon. Place your order soon. Fresh Offer!! Shop the cute playsuits for all little boys and girls which are of different styles, brands, various sizes, colors. Now avail these cute little collections by getting 35% off discount. No code required. Make them even more happy with these clothing products. Let the Princess look adorable, beautiful in pretty dresses from hopscotch.in and also get upto 75% off. Choose from top brands like sara kids, Flowerbutterfly, Xia, Carters and many. No minimum purchase and coupon code required to avail the offer. Hopscotch is offering upto 60% off on carters apparels for New born, Boys and Girls. No minimum purchase and coupon code required to avail the offer. Hurry Up! Order Now. Hopscotch Carter&apos;s Exclusive Offer: Purchase footwear from carters brand and Grab upto 80% Off On Everything + Extra 50% Off On Second Pair. Choose from various categories footwear like Shoes, Sandals, Slip- ons and many more. no coupon code required to avail the offer. Hurry Up! Buy now. Fabulous offers from Hopscotch. Save flat Rs 600 off on Rs 2000 & above. Buy anything from hopscotch online shopping website from any category. Use the coupon code at cart page to get the discount. Shop now! Hurry! Shopping for your little ones has never been better. Explore through a range of tops, bottoms, onesies, and rompers here on Hopscotch for attractive deals over your favourite picks. Explore through the range available for different age groups for kids, and newborns ranging from 0-6 months, 6-12 months and older. Avail upto 80% off. Hurry Up!! Chose the right footwear to suit any occasion, shoes for casual and formal events. Find popular brands at discounted rates like never before. Find your favourite brands of shoes at the most reasonable prices with attractive offers here on Hopscotch. The latest stock is refreshed with new deals and coupons that avail with colour combinations that suit the personality and style. The range of products in the ethnic wear category comprises of lehengas, dresses, kurtis and more. Find tastefully picked and a classy collection of ethnic wear here on Hopscotch. With a gentle grace and a clean cut design, these clothes fit perfectly for the modern woman with a liking towards the ethnic side. Find popular brands at impressive deals and discounts on specific products. Adorable party wears dresses for your little girl, with ruffles, flared and other features to make her look like a princess. Save upto 77% off. Shop from a range of options available for dresses, skirts, tops and more. Shop from popular brands such as TS, Bluebell, Cherry blossoms, A.T.U.N and more. Shop for satin, floral, printed, lace and more types of dresses that your little girl would love to wear to a party.